Introducing Ingentia prima, a large, four-legged, long-necked dinosaur that lived a whopping 47 million years before giants like Diplodocus and Brontosaurus shook the Earth. Found in Argentina, its fossil is providing important new insights into the evolution of dinosaurs, and how sauropods grew to such colossal sizes. Sauropods – the largest land animals to ever appear on Earth – came from humble beginnings. Their distant ancestors were small, agile, two-legged dinosaurs known as prosauropods. Over time, however, these raccoon-sized creatures steadily acquired the physical characteristics that allowed for the emergence of immensely large bodies, the biggest of which exceeded 77 tons. These adaptations included such things as small skulls, long necks and tails, column-like legs, rapid bone growth, and pneumatic vertebrae, where air spaces exist within the bones to make them light (a trait that still exists in modern birds). Sauropods were widely and wildly successful during the Jurassic period (199 million to 145 million years ago), and their appearance represents an important stage in the history of dinosaurs. Paleontologists figured that many, if not most, of the characteristics required for bodies in excess of 10 tons emerged during the early Jurassic, but the incomplete fossil record has clouded the details of this critical evolutionary stage. Now, the discovery of Ingentia prima – a member of the Lessemsaurid group of dinosaurs and an ancestor of sauropods – shows that some dinosaurs had acquired several key characteristics during the Late Triassic that paved the way toward gigantism. Artist’s impression of I. prima, with internal structures. Ingentia prima, which means “the first to be huge” in Latin, lived some 237 million to 201 million years ago in what is now Argentina. The partial fossil, found buried within the southern outcrops of the Quebrada del Barro Formation in northwestern Argentina, consists of several neck vertebrae, a shoulder bone, and several bones from its legs and tail. The new paper describing this previously unknown dinosaur was published today in Nature Ecology & Evolution. For the new study, lead scientist Cecilia Apaldetti and her team from the National University of San Juan analysed the fossil, along with three new specimens of a closely related and previously documented dinosaur known as Lessemsaurus sauropoides (which was done for comparison). Analysis showed that I. prima weighed between seven and 10 tons (the largest African elephants weight between six and seven tons), and it already exhibited an elongated neck and long tail, though not nearly as pronounced as those seen later. These creatures, unlike the sauropods that would come later, stood on bent legs, and featured bones that thickened through accelerated bursts, rather than steady, but still rapid, growth. I. prima exhibited features that allowed sauropods to become sauropods, such as an accelerated growth rate (as seen in its bone structure), and straight legs capable of supporting tremendous weight. What’s more, I. prima had a bird-like cervical air sac and a neck with a high surface-to-volume ratio – characteristics that functioned like a built-in air conditioning system, allowing this oversized animal to stay cool. 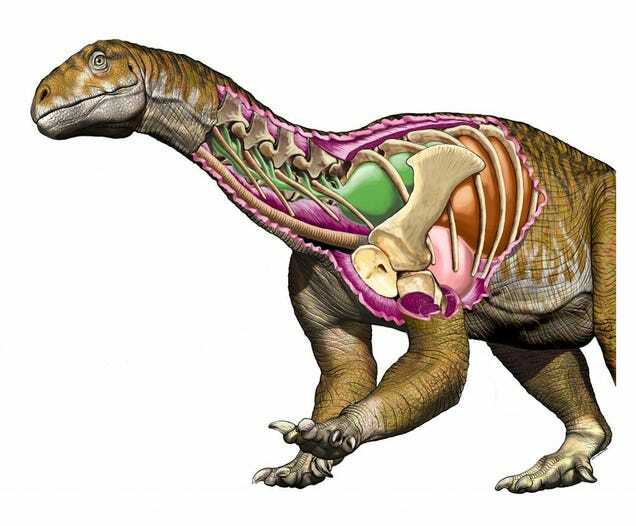 Lastly, it featured structures in its backbones and hind limbs essential for supporting large bodies. The authors say many of these adaptations were not specific to gigantism, instead allowing for greater mobility as I. prima moved across the Triassic landscape. “This reveals that the first pulse towards gigantism in dinosaurs occurred over 30 million years before the appearance of the first [true sauropods],” write the researchers in their study.